A third-year expansion team met up with a club hoping to bounce back from a disappointing season as the Minnesota Vikings took on the 49ers in San Francisco on September 15, 1963. Minnesota went 5-22-1 in its first two seasons in the NFL, including 2-11-1 in 1962, and was looking to advance. Head Coach Norm Van Brocklin’s team was still very much an erratic work in progress, with a promising offense and problematic defense. 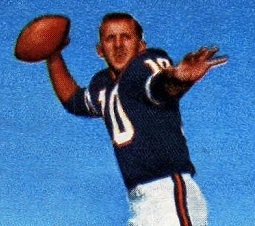 QB Fran Tarkenton used his scrambling ability to good effect and HB Tommy Mason (pictured above) emerged as a star in his second year. It was hoped that FB Bill Brown, obtained from the Bears the previous year, would add inside power and blocking and that rookie split end Paul Flatley would improve the receiving corps. There was talent on defense, most notably DE Jim Marshall, LB Rip Hawkins, and CB Ed Sharockman, but the loss of the club’s first two draft choices, DT Jim Dunaway and LB Bobby Bell, to the rival AFL was a huge disappointment. The 49ers had dropped to 6-8 the previous year, down from three straight seven-win seasons, and all under innovative Head Coach Red Hickey. Injuries had been a big part of the problem, and thus improvement was anticipated. However QB John Brodie, who was erratic but talented, had been injured in an offseason auto accident and appeared to be slow in recovering, while FB J.D. Smith, a capable runner, was weakened by illness. Still, flanker Bernie Casey led a good corps of receivers and CB Abe Woodson provided an additional weapon with his excellence on kickoff returns, in addition to being a solid defensive back. The level of discontent with the team was reflected in the attendance of 30,781 fans at Kezar Stadium, the lowest for a San Francisco home-opener since 1950. Nevertheless, things started off in electrifying fashion for the home team when Abe Woodson (pictured at left) took the opening kickoff and returned it 103 yards for a touchdown. 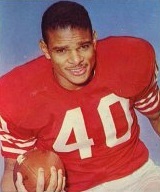 Tommy Davis added the extra point and the 49ers were up by 7-0 at just 17 seconds into the game. The Vikings responded by driving 76 yards in 12 plays. 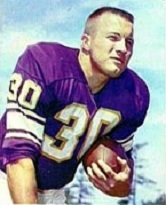 Fran Tarkenton converted a third-and-eight situation with a completion to Paul Flatley for 32 yards to the San Francisco 20, and while an offensive pass interference penalty and loss of seven yards on a running play by HB Bill Butler moved the visitors back, Tarkenton fired long on a third-and-31 play to Tommy Mason, who caught the ball at the 15 and, shaking off a defender, ran the rest of the way for a 41-yard TD. Cox converted to tie the score. The 49ers came right back with a scoring drive. FB Lloyd Winston had a 26-yard run and John Brodie scrambled for 12 yards to set up a 35-yard Davis field goal. The Niners were back in front by 10-7. Butler returned the ensuing short kickoff 26 yards to the Minnesota 40. Bill Brown picked up 25 yards on five running plays and Tarkenton threw to TE Jerry Reichow for five yards, but another pass intended for Reichow at the goal line was broken up by CB Kermit Alexander at the goal line. On the first play of the second quarter, Cox kicked a 37-yard field goal to again even the score. The teams exchanged punts before the 49ers, starting from their 23, immediately picked up 38 yards on a run by Winston. Brodie threw a screen pass to J.D. Smith that gained 40 yards to the Minnesota five, and the six-play, 77-yard possession ended with Brodie rolling out and passing to Bernie Casey in the end zone for a one-yard touchdown. Davis added the point after and the Niners were back in front by 17-10. The Vikings again had to punt and Brodie passed the 49ers to the Minnesota 49 with time running out in the first half, but Davis was short on a 54-yard field goal try and the score remained unchanged at halftime. Minnesota started off the third quarter with a promising drive highlighted by two plays by Bill Brown (pictured at right). First the fullback ran off tackle for a 21-yard gain and then he gained 14 yards on a screen pass. But after reaching the San Francisco 29, Tarkenton threw a pass that was intercepted by Woodson. The 49ers advanced into Minnesota territory on a series highlighted by a pass to TE Monty Stickles for 17 yards and Brodie rolling out to his right and carrying 24 yards to the Vikings’ 41. After reaching the 38, Brodie threw twice for the end zone with both passes falling incomplete and Davis kicked a 45-yard field goal to give the home team a ten-point lead of 20-10. The Vikings responded with another promising drive featuring four completions by Tarkenton, but again they came up empty when Mason fumbled and Alexander recovered at the San Francisco 16. A short series by the Niners ended with a punt and, in a possession that extended into the fourth quarter, Minnesota advanced 67 yards in nine plays and did not fail to score. Tarkenton started off with consecutive completions to Mason, for 15 and 11 yards, and a throw to flanker Leon Clarke gained 13 yards. A second-down pass to Flatley was good for 10 yards and moved the Vikings inside the ten, and two carries by Brown picked up the remaining yardage, including the last four for a touchdown. Cox’s extra point made it a three-point game. Once again the 49ers were held to a short series and punted and the Vikings responded by driving 71 yards in 13 plays. Brown continued to run effectively and Tarkenton completed a pass to Reichow for 19 yards and two to Flatley for seven and 16 yards. Mason ran for the last two yards and a TD and, with Cox adding the point after, the visitors were up by four points. In the remaining four minutes, San Francisco had the ball twice more, but the home team couldn’t get out of its own territory. An interception by CB Ed Sharockman sealed Minnesota’s 24-20 win. The Vikings easily led in total yards (418 to 246) and first downs (27 to 10). They topped San Francisco in both on the ground (156 to 126) and through the air (262 to 120). Minnesota also turned the ball over two times, to one by the 49ers. Fran Tarkenton (pictured below) completed 20 of 29 passes for 262 yards and a touchdown, giving up one interception. Bill Brown rushed for 77 yards on 16 carries that included a TD and Tommy Mason contributed 68 rushing yards and a touchdown on 21 carries and also topped the Vikings with 6 catches for 94 yards and another score. Paul Flatley and Jerry Reichow each had five pass receptions apiece, for 72 and 61 yards, respectively. 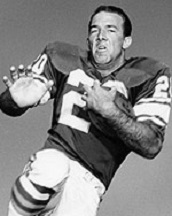 For the 49ers, John Brodie was successful on 11 of 23 throws for 125 yards and a TD as well as an interception, and also ran for 42 yards on four carries. Lloyd Winston gained 81 yards on 10 rushing attempts. Bernie Casey caught four passes for 34 yards and a touchdown, although J.D. Smith had the most receiving yards on his one reception for 40 yards. As a runner from scrimmage, he was held to minus one yard on five carries. Thanks to his touchdown return on the opening kickoff, Abe Woodson averaged 60.0 yards on his two returns and also intercepted a pass. The Vikings lost to the Bears the next week, thrashed the 49ers in their rematch in Minnesota, but then lost four straight games on the way to a 5-8-1 record and tie for fourth with Detroit in the Western Conference. They continued to improve on offense, with Tommy Mason again going to the Pro Bowl and garnering consensus first-team All-NFL recognition as he rushed for 763 yards on 166 carries (4.6 avg.) and caught 40 passes for another 365 yards (9.1 avg.) and scored a team-leading total of nine touchdowns. Bill Brown ran for 445 yards while Paul Flatley received caught 51 passes for 867 yards (17.0 avg.) and was named Rookie of the Year by UPI and The Sporting News. Fran Tarkenton also continued his steady development, completing 57.2 percent of his passes for 2311 yards and 15 touchdowns, but was being pressed by rookie Ron VanderKelen by season’s end. San Francisco sank all the way to the bottom of the conference at 2-12 and Coach Hickey was gone after three games. John Brodie was lost at that point as well with a broken arm, J.D. Smith failed to play up to his usual level, and key injuries weakened the defense, particularly the midseason loss of DT Charlie Krueger. Abe Woodson remained a bright spot as he led the NFL in kickoff returning for the second straight season (and third overall) with a 32.2-yard average that included three touchdowns. He was named to a fifth consecutive Pro Bowl.